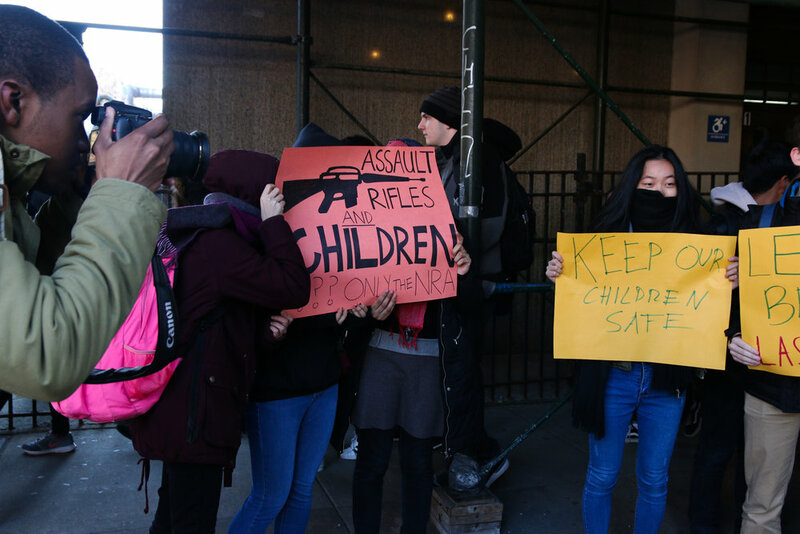 Today (March 14th, 2018 aka #NationalSchoolWalkOut) I joined the youth at Brooklyn Technical High School to document and give a platform to voices who will not be silenced. 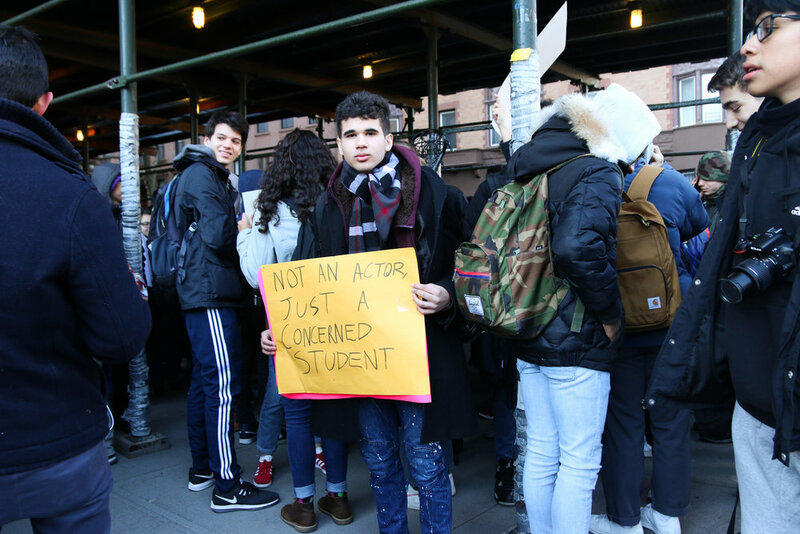 This walkout raised awareness to "protest Congress’ inaction to do more than tweet thoughts and prayers in response to the gun violence plaguing our schools and neighborhoods" - The Action Network. 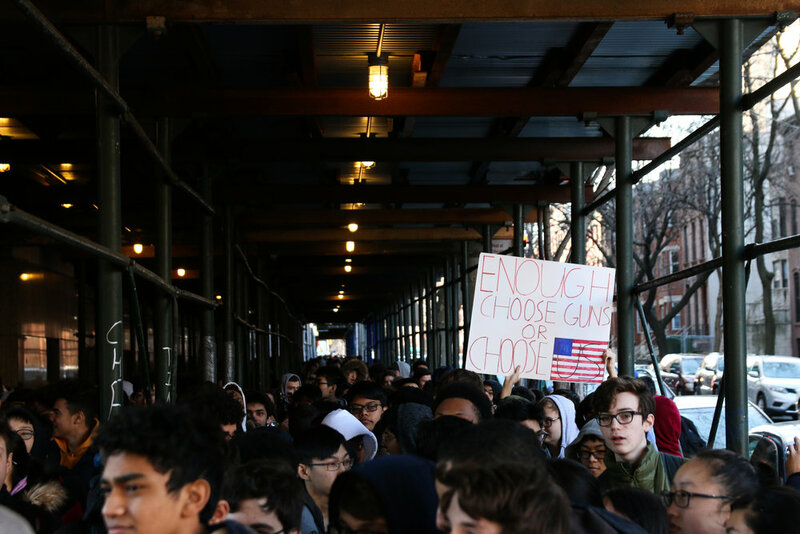 At 10:00 am across the nation students took to the streets for 17-minutes to honor all of the lives taken at Marjory Stoneman Douglas High School in Parkland, Fl on Feb 14th, 2018. I marched with the students because I, too, am sick of the NRA, gun lobbyist and the inaction of politicians who are padding their pockets with blood money — in favor of loose gun laws over the safety of this country's inhabitants. The youth are our future - but what is the point of this phrase if we aren't listening? Alongside these powerful photos I had the chance to interview two students from Brooklyn Technical High School (BTSH) and a few of my peers and parents on why they marched. Lucia Paz, Senior at BTHS - "To raise awareness and show that students voices matter and that we do care about this issue. We want politicians to see this is what we care about. So that when we are eligible to vote this is what we are going to be voting on." Haley Lucas, Senior at BTHS - "I'm here today to show that enough is enough and I'm tired of turning on the TV and seeing another school shooting. We want action and we want it now!" Ariel Tolefree-Williams, Neighborhood Services Program Coordinator - "So a few of us from my office decided it was important to stand with the students because these shootings are ridiculous. If there is anyway to prevent the shootings, or bring attention to the fact that we shouldn’t have to protest to not have kids shot at school, then that’s what we are here for. Some teachers and the principal weren’t happy but that’s the point of the protest, you should never be afraid to go to school because you may not come home that day. There was about 100 kids out there too. In addition to that, I work in local government and we’ve had people come in here very angry we get scared too something could happen. We need better gun control and we need to protect each other, whatever that takes." Yozmine Modeste, Social Worker at Fannie Lou Hammer Freedom High School - "If ever there is an opportunity to stand up for what is right, stand up for children's lives why not do it? This is not the first mass school shooting and I wish I could say it is the last. I want this to be our last. I walked out in support of our future, our kids. We are only dimming our future so long as we allow our children’s lives to continuously be cut short due to senseless acts of violence, acts of violence that could have been prevented." Xavier Webber, 7th Grade History Teacher at Brownsville Collegiate Charter School - "The reason I participated in the nationwide walkout, tomorrow is not only because I feel it’s necessary for the change we want to see in this country when it comes to the issue of guns and the violence that comes about from them but I want my students to know that they are just as much a part of this process as I am. This is a moment of learning for my students as we take part in this demonstration they’ll know that if they are unhappy with the issues of our country they have the right to voice their opinions." Sheila Williams, Retired 2nd Grade Teacher formerly of Bauer Speck Elementary School - "Our youth are watching and listening. We must listen to their concerns. Their concerns include safety in schools. They should not worry about the next active shooter that would bring injury and death. March and demand that the leaders of our country will aid in the protection and safety of our future. Students represent our future. Gun control is a must, along with raising the age minimum to 21, banning the sale of assault weapons of all kinds. Our youth is watching. Let's do the right thing for them." Michael Williams, Campus Security at Templeton High School - "Students have the right to voice their opinions because it is in their own interests to set the path for their future."